Sam is collaborating in a project about the historical and cultural place of salt cod that focuses on how different communities in Brixton – including Portuguese, Italian and Caribbean – consume it. He decided to make salt cod fritters and I decided to make this to eat them with. Brian at Fish Wings & Tings makes wonderfully light cod fritters with lime and ginger dip, which gave me the idea for this. I wanted the fruity flavour of the scotch bonnet to come through, not just its heat and I think this worked well. Sam’s fritters were really very delicious: packed with fish but still light inside and a crisp exterior. They had a deep savoury flavour and touches of sweetness from red pepper – I’ll get him to give me the recipe to put up here. Place the chopped scotch bonnet chillis in a small pan with the water, sugar, vinegar and salt and cook for 30 minutes on a low heat, not allowing it to dry out. If it becomes too dry add a bit more water. 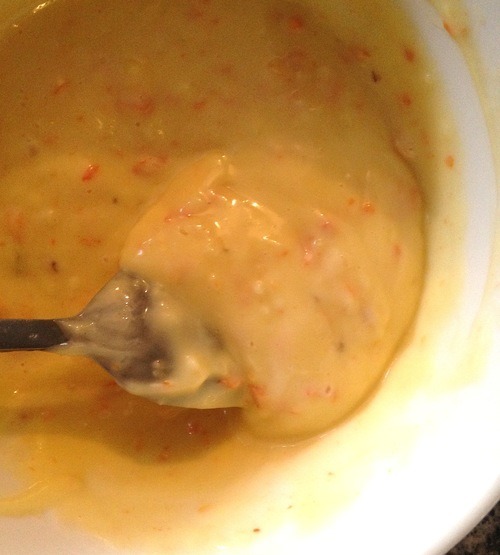 If you have a blender, roughly blend the scotch bonnet so it is smoother but still with a bit of texture. Meanwhile, mix the egg yolks well with the crushed garlic and the vinegar in a bowl. Pour in the oil very slowly, mixing thoroughly with a fork or a whisk as you go. When it is all incorporated, taste for seasoning, and add more salt if needed. Stir in a tablespoon of the chilli mix and squeeze in the lime juice. Adjust the heat to a level you find acceptable – they may be some chilli mash left over. 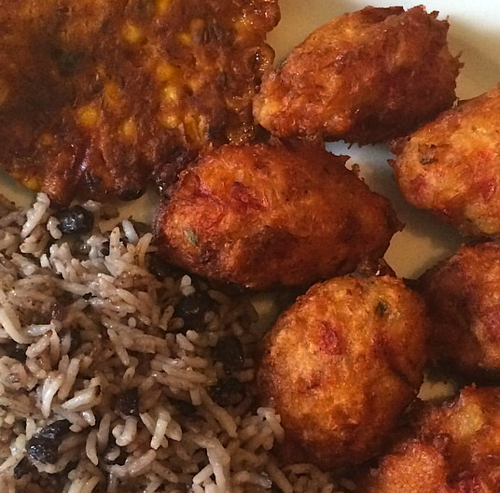 Salt cod fritters. Followed by pork chops with rice and peas.